Fan Fiction Charlie Brown | i make words go vroom. Police responded to a disturbance last Tuesday at approximately 6:55 PM in the parking lot at Arby’s on James Street. An elderly woman named Miss Othmar, who played the teacher in the Charlie Brown TV specials, was taken into custody and later released on $25,000 bail. Surveillance video of the entire incident was secured and is being reviewed by police as the investigation continues. Welcome to Arby’s, can I take your order? I’m sorry, I did not get that. Can you please repeat your order? Listen whoever you are. I don’t have time for your foolish games. Customers are waiting! If you want to place an order, please speak slowly so that I can understand you. WAAAAH – WAAAAH – WAAAAH – WAAAAH – WAAAAH – WAAAAH – WAAAAH. That’s it, I’m getting the manager! You’re in big trouble mister! The employee left the drive-through window to seek out the manager. Meanwhile, a line of cars filed in behind Miss Othmar stretching out to the street. Customers were growing impatient. Thank you for choosing Arby’s. This is the manager. How may we serve you today? I was afraid you might say that. Now listen to me and listen to me very carefully. I don’t know who you are, and quite frankly I don’t want to know who you are. But this is a business we are trying to run here, and we are very busy. If you cannot place your order in a civilized manner I’m afraid I’m going to have to ask you to leave. So, would you like to start over with that order please? You picked the wrong Arby’s manager to mess with, pal. I’m coming out there – stay right where you are! 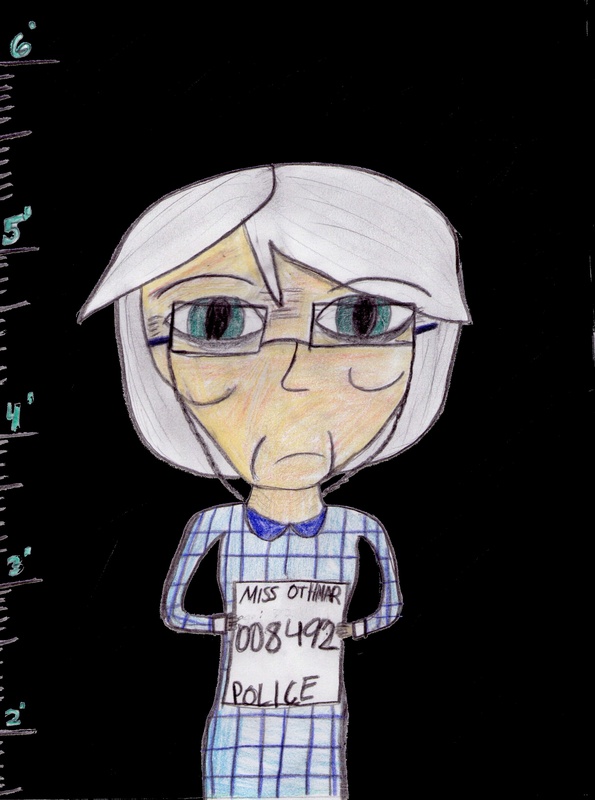 Miss Othmar then stepped out of her car and cracked the manager over the head with her cane. Dazed and confused, the manager attempted to block Miss Othmar from getting back into her car but to no avail. Miss Othmar jabbed the end of her cane into the manager’s gut and jumped back into her car, leaving the manager writhing in pain underneath the drive-through speaker. Miss Othmar put her car in drive and proceeded to flee the scene at 45 MPH before losing control of her vehicle and slamming into a parked car. Police arrived shortly thereafter. An eyewitness, covered from head to toe in grease, ran over from Pig-Pen’s Muffler Shop from across the street. He identified himself as Pig-Pen, the proud proprietor of Pig-Pen’s Muffler Shop from across the street. He said he knew the woman, Miss Othmar, and that she taught him reading, writing, and arithmetic at Birchwood Elementary School when he was 8. Pig-Pen said Miss Othmar was the nicest teacher one could ever have. And he was willing to bet that all of his friends: Charlie, Linus, Lucy, Sally, Peppermint Patty, and Schroeder (when he is finished with his piano lesson) would corroborate their teacher’s innocence. Within a half-hour, Charlie, Linus, Lucy, Sally, Peppermint Patty and Schroeder joined Pig-Pen at the police station. In earnest they explained to the arresting officers that the incident with their old teacher was a misunderstanding. Although it had been 35 years since they’ve seen Miss Othmar, it was very clear to them that all she wanted from Arby’s that night was a Beef ‘N Cheddar Classic and some curly fries.